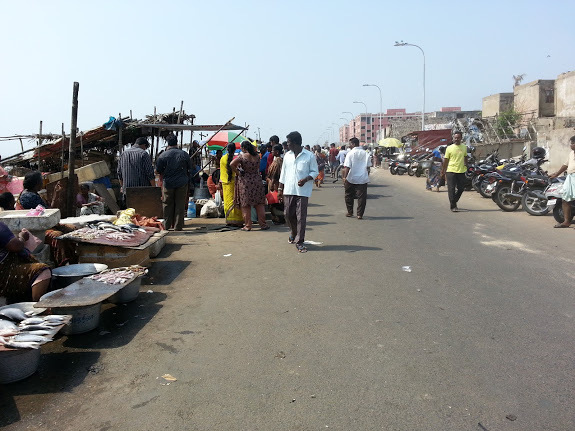 Chennai Fish Markets – Sunday morning outing! Fishes are to be bought, sand crusted, fresh off the nets under the blazing sun against the backdrop of the magnificent Marina beach, the second largest (and possibly the filthiest) beach in the world. Buying fish at the fish market is really an experience in itself. It’s not for the fair-and-lovely brigade – be ready to get super tanned. It’s not for the faint hearted and sensitive nosed. You don’t have to go pick up a fish, just roll your window down while driving through the road and the fishy smell will hit you right in the face (Gappu Guppu!). 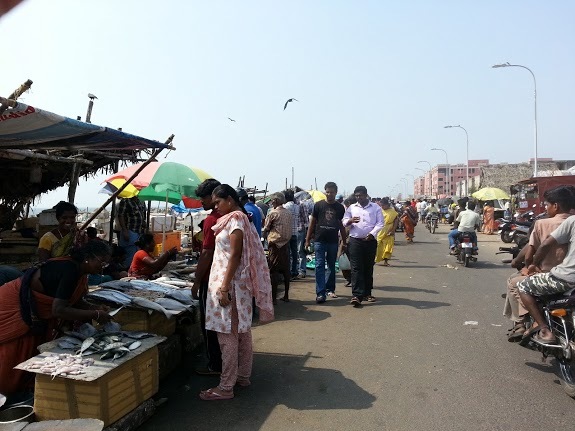 You’ll have to navigate your way through several Chennai-28 type cricket matches on the road leading to the market. Goats and Chicken laze around the edges of the road on either side. This road is rife with speed-breakers. These speed breakers have a sound reason to be there. One side of the light-house road is lined entirely by huts and shacks and many people who’ve just waken up from their bedroom (the hut), stroll languidly across their hall (the road), towards their bathroom (the sea). So, drive slow. This side of the lighthouse, the beach is much narrower and the sea much nearer, you can see the boats parked casually along the coast, the fish sellers mostly women seated along the edge of the road under large parasols with Vanjaram, Sura, Koduva, Sankara, Vavval, Kelluthi, kadamba, Eral and so many more fishes that I can’t even identify, laid out on their make-shift wooden stands. Sunday mornings are the busiest. You’ll find lots of husbands and wives with wire baskets haggling with the women. You’ve got to be good at bargaining and knowledgeable about the fish rates to buy here. Whole Vanjaram or Koduva cost anywhere between 500 and 1000 bucks depending on the size of the fish and the women quote at-least 200 to 300 rupees more than what they finally agree to. These women are really impressive. They’re tough, skilled and totally street. There is so much variety, it truly is amazing. At this point I’ll have to digress a bit to address a long-time grouse. A long time back I came across a very prejudiced, pretentious article on the net, something along the lines of Chennai eating out guide by an IMSC person and I remember him saying Chennai diners don’t care whether it’s Vanjaram (mis-spelt “Banjaram”, here in Chennai we don’t substitute every “V” with “B”), squid, pumpkin etc as everything is the same to them. What the hell! What does he know? Has he ever been to the Lighthouse fish market or the one on Lloyds road? Now, reviewing Chennai restaurants is one thing, commenting about Chennai people is another thing. I took serious offence. Yeah, most restaurants are mediocre, not just in Chennai, but in any other city as well. What a discovery (should be aired on discovery channel). We like our curries hot and spicy, so that’s how you’ll get them (Konaal aanalum yengalodadhu aakum). If you want Thai food exactly like the Thai food in Thailand, you must go to Thailand. Authentic Ayyasamy! There are lots of these kinds now – the over-pompous self-important uncles (OPSI). Chennai people are so nice and docile (Ileechavaays). Every OPSI uncle tells us how tawdry and tasteless we are and their snobbish tirade becomes a Metro plus food guide. What! Chennai is always such an easy target. Chennai in many people’s eye is a KuGramam (village) and Bombay, Delhi, Calcutta or Bangalore is Seemai (Big Town). They just don’t get it. We’re not that much into malls, pubs, hypermarkets, big ring roads and huge complicated flyovers (there are malls, discos & pubs in Chennai too but not as many). We love platform shopping at Pondy Bazaar more than window shopping in malls. We don’t drink for style, we drink seriously. We don’t order a single beer for 400 bucks at a restaurant and sip slowly throughout the meal. We buy them by crates and party all night. We have our TASMAC and for more exotic stuff, Burma bazaar. We don’t like piling bathroom chappals, frozen shrimp, cellophane wrapped wilted vegetables, coffee powder, bedsheets and dishwashing liquid all together into our super-market trolley. We buy vegetables at Mambalam, seafood at Lighthouse and coffee powder in Mylapore. We hate complicated flyovers and huge ring roads. We like diversions and one-ways. We’re nowhere as congested and we follow our traffic signals. Chennai ippadi thaan. 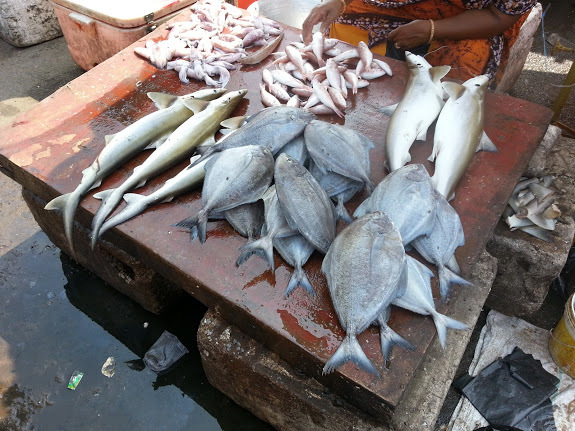 So back to fish shopping, There are two major fish markets in Chennai (the only two that I’ve been to) the Lloyds road fish market, the favourite among old-timers and the lighthouse fish market which is a much more recent phenomenon. I am usually a silent spectator because I am new to this and I am useless at bargaining. My mother-in-law an expert at this does the dealings. Every fish-seller usually has a helper alongside who’ll scale, cut and clean the fishes for you for an extra fee. The fish-cutters at Lloyds road apparently do a much better job. Everybody has their own favourite fish-cutter and is fiercely loyal towards them. They’d wait their turn to get to their favourite fish-cutter. These guys make your job a lot simpler. You’ll find a lot of the exotic stuff at the Lloyds road market. Viraal is an eel like looking fresh water fish that is quite pricey and is much sought after by the seafood buffs. Viraal when cooked is awfully soft and has a very distinctive taste. You’ll also find live crabs crawling out of bamboo baskets at the Lloyds road market – both the green and red varieties. My kids are awfully fond of watching these little creatures pop open their bamboo cases and silently crawl out. Keep a watchful eye on these crabs, they have extremely strong pincers and it’s quite difficult to shake them off. We almost always bump into somebody we know at the fish market. It’s the place to be on Sunday mornings. You’ll meet the who’s who of the sea-food loving people in Chennai. Switch off your Sunday morning re-telecasts and go to the beach. It is fun. 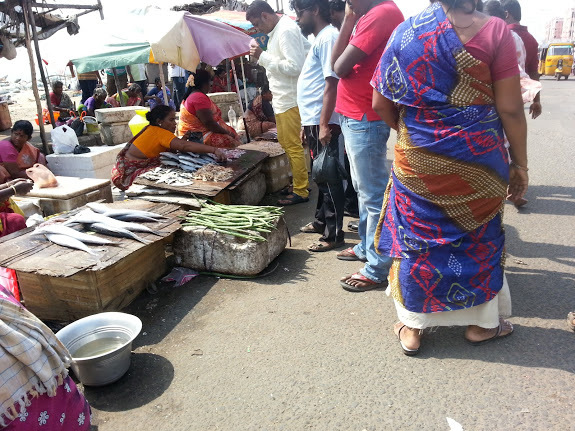 This entry was posted in Chicken, Fish & Meat, Musings and tagged chennai fish market, crabs, fish market, koduva, lighthouse market, lloyds road market, marina beach, shopping, sura, vanjaram, viraal. "we have our TASMAC"! Really! First things first – a great piece, coming straight from the heart – the whole stuff really captures the Chennai spirit – veggies from Mamabalam and fish from Lighthouse! I am new to the city (spent all my life above the Tropic of Cancer, and yes, have been committing the unforgivable sin of piling bathroom chappals with frozen shrimp on a cart). Love a sundowner after a hard day's work, which makes me a frequent visitor to the TASMAC outlets. Now what in god's name can make you proud of the wretched places!! I have been to some pretty hairy places in my life, but nothing, and nothing comes close to the experience of buying liquor at TASMAC outlets. Places so filthy, they would make a public toilet in at a city bus stand appear a luxury place in comparison. The intensity of the stench of urine and sweat can put an elephant to coma. Men outside the heavenly gates of a TASMAC outlet lying on the footpath, passed out, drenched in their own puke and urine. And wonder of wonders, you have to pay a premium over printed rates for this exotic shopping experience! But yeah, you gotta look at the positives. I have never once got mugged at a TASMAC outlet, though every time i go in, i give myself a 50:50 chance of that. 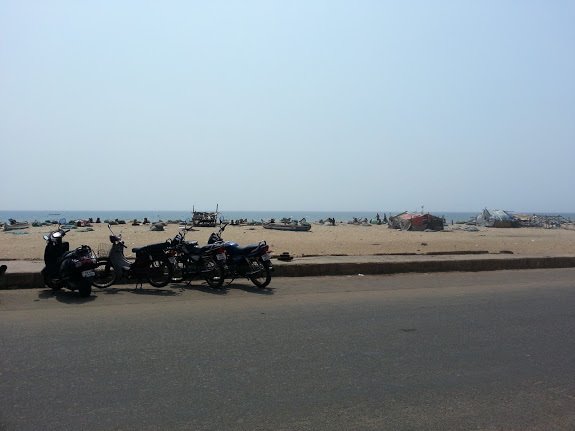 TASMAC's are terribly filthy, dismal places.. I never claimed otherwise. I was only listing down the options. But I understand your angst. Now there's an elite TASMAC I heard, in Alsa Mall, Egmore which is much more decent. Burma Bazaar is also a good option.